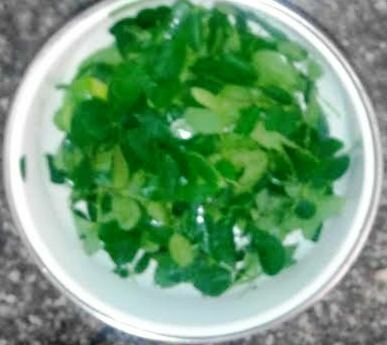 Drumstick leaves recipe is very tasty and nutritious. They are widely used in South India, especially in Kerala and Tamil Nadu. Drumstick is also known as Moringa, and it is referred as the miracle tree because of its many health benefits. Moringa leaves are highly nutritious and healthy which contain all the essential vitamins and minerals required for our body. This recipe is also known as Murinjakkai ila thoran and Murinjakkai keera thoran in southern part of India. Cooking oil - 2 tsp. Wash and keep the drumstick leaves in a vessel. Chop the onion and green chillies (lengthwise), and add to the drumstick leaves. Add turmeric powder, coconut and salt. Mix the ingredients well in the vessel with hand, without using spoon. Heat oil in a frying pan and add the mustard seeds. When they splutter, add urad dal. Add the mixed leaves into it and sprinkle little water. Cover up the pan and cook for about 5-7 minutes, in low fire. Cook one small cup of tur dal, preferably in a cooker till two whistles. Add two cups moringa leaves, (preferably tender leaves) one chopped onion, 2-3 green chillies, few garlic pods, 1/2 teaspoon turmeric powder, 1/2 teaspoon chilli powder, and salt as desired. Then cook the whole thing with dal for another 5 minutes. Add 3/4 cup coconut, well ground, and cook again for 1-2 minutes. Remove from the fire and add 2 teaspoon coconut oil on top and cover it for 5 minutes. The curry is very tasty and can be used with rice or chapathi. As you know drumstick leaves have many health benefits. You may not get fresh drumstick leaves for your daily needs, unless you have a tree in your backyard. When you get more leaves you can make drumstick leaves powder and use 1-2 teaspoons for your daily purpose. 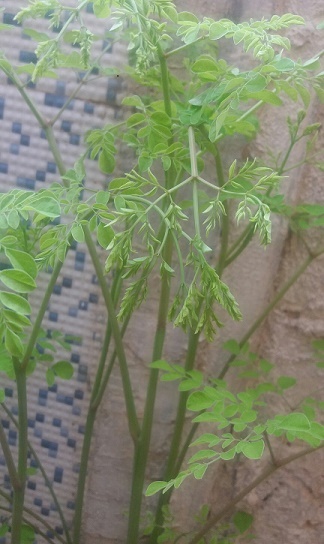 Interested to learn more about moringa (drumstick) leaves? Check out the following video about moringa leave recipe.